Providing innovative, creative, and responsive environmental cleaning and material handling. Solutions to governmental, institutional, industrial, municipal, and contractor customers worldwide. RELY ON THE LEADER | Clean streets and surfaces are vital to air quality, water quality and overall community health and safety. 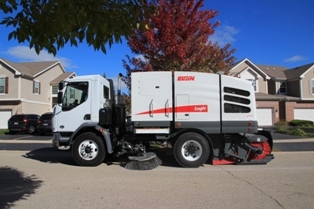 True clean requires a rugged, reliable machine that can take it to the extreme like only Elgin street sweepers can. Backed by nearly 100 years of engineering and manufacturing know-how, service excellence, the highest sweeper standards and the support of the industry?s strongest dealer network, we uphold the Elgin promise for our street sweepers every day to be there for the life of your machine.